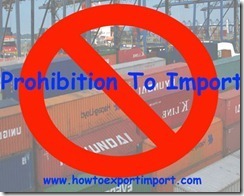 What you mean by prohibition to import goods? Who decides to prohibit import? Why prohibition of import of specific goods? One of the main objectives of prohibition of goods to any importing country is that import of such goods should not weaken the economic status of importing country. If any import of goods adversely affects the health of human, animal, plants and other species, such goods also may be prohibited to import by the government of importing country. The prohibition to import any goods is decided by the government of importing country under foreign trade policy amended time to time if necessary. The list of such prohibited goods for import is published by government of importing country with amendments time to time. 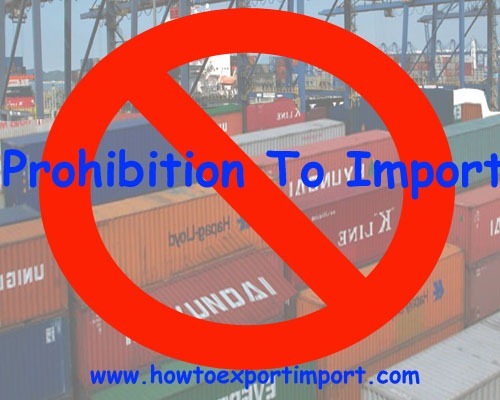 The importer may collect information on their importing products from authorities, whether it falls under prohibited list of importing nation. The above basic information explains the reasons to prohibit goods to import in a country, the meaning and objective of prohibiting products to import etc. Why to insure export goods? Samuel Kostka : On 13 February 2015 We will be for the first time importing a commodity from third world country(Sri Lanka in our case), to the European Union - country Slovakia. It will be approx. 1,5 CBM size and have a value of 3300 USD.Could you tell me, which payment method would you advise to me? The imported commodity is coconut oil packed in 500ml glass jars.Also, if you do have any tips for the import from India/Sri Lanka, please state them. Aruna Shinde: On 13 February 2015 Please, Let me know the HDPE ,LDPE, PVC ,PP material comer under which export promotion council? Admin: On 13 February 2015 Hello Samuel Kostka, You may read TERMS OF PAYMENT IN INTERNATIONAL BUSINESS in this website, to have a clear idea about import export payment terms which you can adopt. Admin: On 13 February 2015 Hello Aruna Shinde, I am not sure, however you may contact Power loom Development and Export Promotion Council whether plastic, HDPE ,LDPE, PVC ,PP material comer under this export promotion council.